In an article for the Jewish feminist group JOFA, Dr. Noam Stadlan objects to what I wrote in the Forward about the Orthodox Union’s stance on women being appointed as Jewish clergy. His objections are several, and I will respond briefly to each below. But, as explained a bit further below, the doctor glosses over the most salient, central point of what I wrote. Dr. Stadlan is correct that I did not acknowledge the fact that there are Orthodox circles where women study Talmud. My apologies for that omission, but what texts are appropriate for formal teaching of women was not my topic. Whether any recognized poskim consider it proper for women to speak before men was likewise not my topic. My en passant reference to women speaking to women was written from my personal experience (though not only in “haredi” shuls), and I apologize here too if it inadvertently insulted anyone. 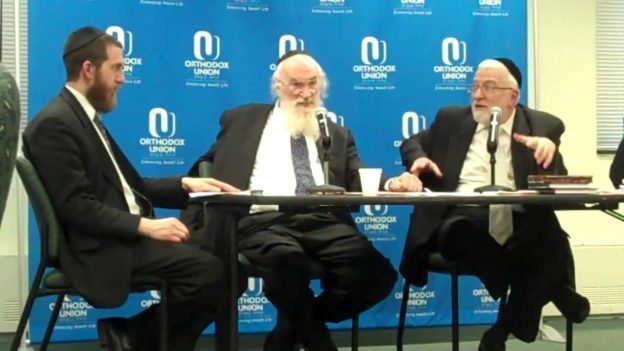 What I wrote – and this is the central point Dr. Stadlan somehow misses – was that the question of women rabbis, which may be a legitimate one and is certainly one of great societal import today, was responsibly placed by the Orthodox Union before poskim to whom it looks for halachic guidance. There is, pace Dr. Stadlan, no Jewish concept of halacha divorced from recognized poskim qualified to apply halachic principles (and, yes, meta-halachic principles no less, which have always been and remain very much part of reaching authoritative halachic decisions). Whom one turns to for a psak is one’s own business, but acknowledging that there are widely recognized and respected poskim in various communities (be they “centrist”, “yeshivish”, or any particular flavor of Chassidic) is not a “no true Scotsman fallacy”; it is the very essence of how halacha has been applied over history to new circumstances – and how it must be responsibly applied today. This entry was posted in Jewish Thought, News, Pluralism on October 23, 2017 by Rabbi Avi Shafran.